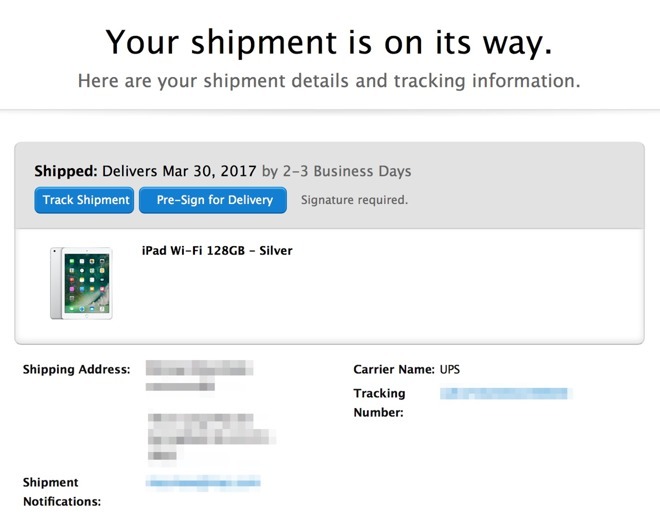 The first batch of 2017 iPads ordered on Friday have shipped from Apple's warehouses, with recipients getting arrival notifications for as soon as March 30. Announced on March 21, as part of several announcements, The 2017 iPad comes the A9 processor, 32- and 128-gigabyte storage options, and wi-fi or wi-fi + Cellular connectivity options. Silver, gold, and space gray colors are available. The product also has an 8 megapixel rear camera without a flash, and a 1.2-megapixel 720p FaceTime HD camera. Other features include support for Touch ID and the international Apple SIM format, which can make it easier to switch data plans. Active battery life is rated at about 10 hours, the same as the 9.7- and 12.9-inch iPad Pros. The display has a 2048-by-1536-pixel resolution, matching the 9.7-inch Pro and the now displaced iPad Air 2. Pricing starts at $329 for 32GB of storage with wi-fi only, ranging up to $559 for 128GB and 4G. Apple authorized resellers B&H and Adorama are offering $10 instant discounts on the new iPad models with no tax outside NY and NJ. Retail sales will begin at some point this week in 20 regions, including Australia, Canada, China, France, Germany, Hong Kong, Italy, Japan, Netherlands, Spain, Sweden, Switzerland, and the U.K. Various other markets including Denmark, India, Mexico, Norway, Russia, Turkey, and will get the new iPad in April, with the remaining countries that Apple services seeing it arrive in May. Apple is also selling polyurethane Smart Covers for $39, in colors including gray, white, blue, pink, and (Product)Red. The new 2017 iPad seems intended to maintain differentiation between the non-pro iPads and the entry-level product. It is the least expensive way to enter the iPad ecosystem, with the 128GB iPad mini 4 retailing for $399.